Hi there! It is Hannah, bringing you a Father’s Day card! 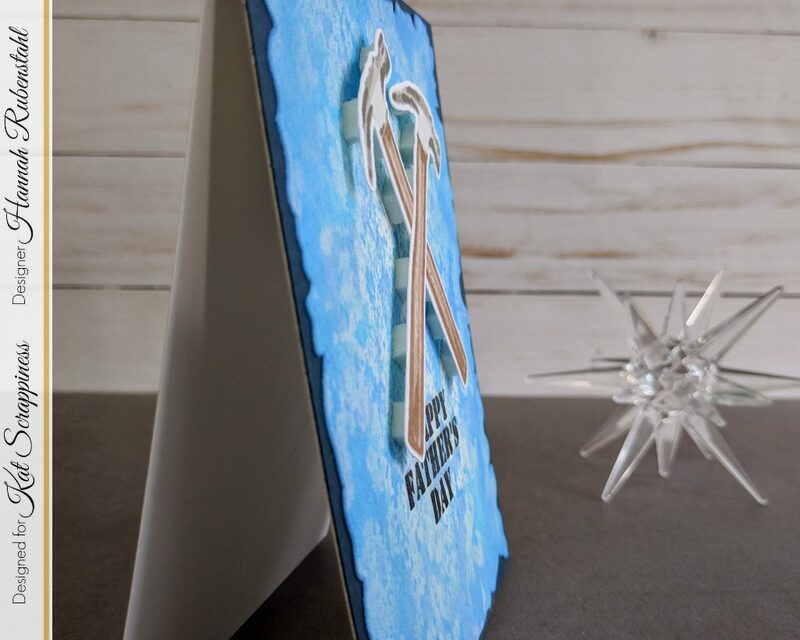 We’ve got just about a month to get those cards to the father figures in our lives, there is no time like the present to start working on them! 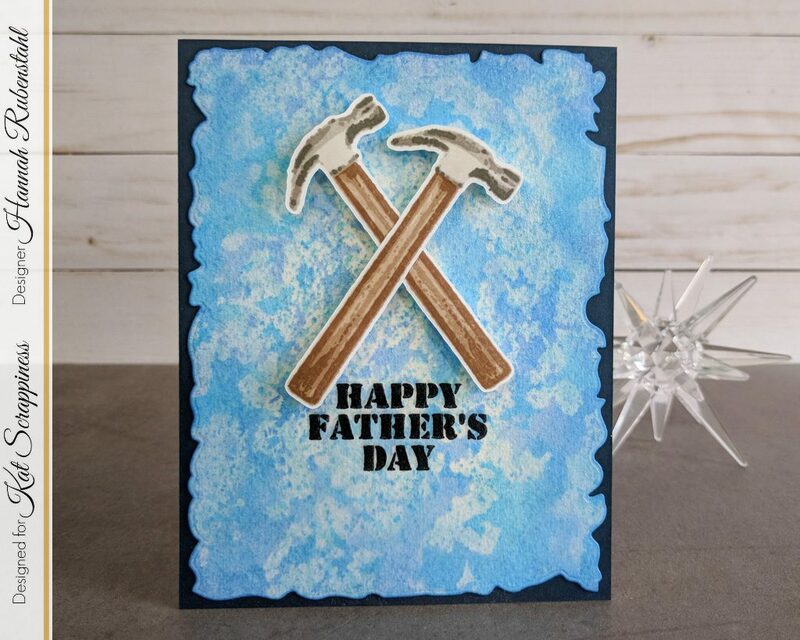 Fortunately, Kat has a new layered stamp set called Dad’s Tools! This set is PERFECT for Father’s Day, men’s birthdays, or just because. There is such a wide range of sentiments in this set you’ll always find a use for it! I started by smooshing Distress Inks: Blueprint Sketch, Salty Ocean, and Tumbled Glass onto some Watercolor Paper. Then I use the largest of the Distressed Edge Rectangle Dies, by Kat Scrappiness, to cut a panel of that out. The finishing touch, on that panel, was to create a vignette look by adding the same Distress Ink along the edges. The hammers I cut out using my Scan-n-Cut, however, it would be really easy to fussy cut. I laid them out to figure out where they would go on my card and then stamped out my sentiment accordingly. This sentiment was stamped using Memento Tuxedo Black and then clear embossed. Finally, I popped my hammers up using foam squares. The watercolor panel was then adhered to some coordinating cardstock I had on hand and voila! The perfect Father’s Day card! Super easy and super fun! This has been Hannah Rubenstahl, of Fanciful Spaces. It is my sincerest hope that I have inspired you to create! 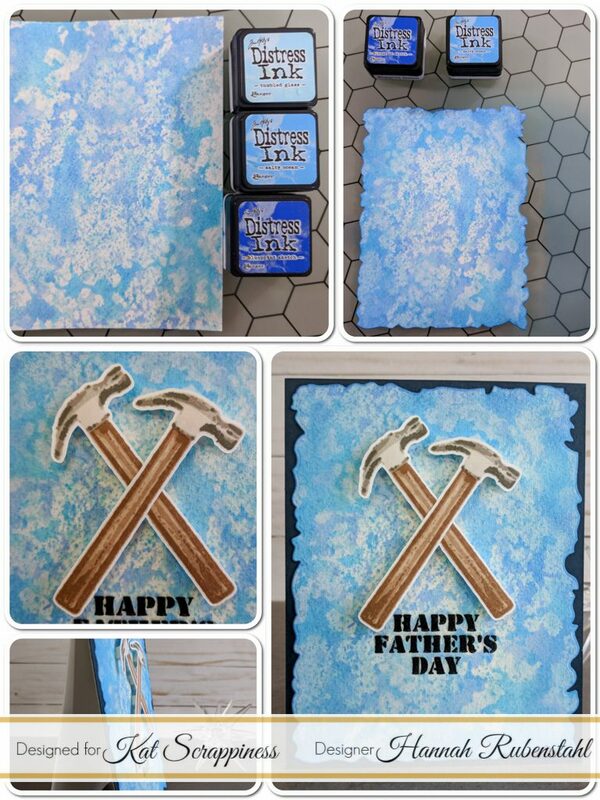 If you need the Dad’s Tools stamp set or any other products at Kat Scrappiness, please feel free to use my discount code Hannah10!